The Morningstar five star rated* EI Sturdza Strategic China Panda Fund returns 63% in 2017, and Lilian Co believes the market has room for a further rebate in the short to mid-term. This meant that Chinese equities were trading at single-digit P/E’s, whilst offering decent returns. Investors however remained sceptical regarding the growth potential for the Chinese market, with lingering concerns as to whether the market would be subject to a hard landing. This scepticism leads to an under-appreciation of the quality of Chinese assets and their growth potential, resulting in the market being penalised by international investors, who retained a structural underweighting. 2017 highlighted the strength and quality of earnings growth, supported by domestic inflows to equity markets. Lilian believes that the negative effects of the reforms within the Chinese markets are now reaching an end and that the Chinese companies have been able to demonstrate their strength as a result of a corporate earnings recovery, attributable to structural changes which have been implemented, rather than a cyclical upturn. Lilian expects growth in China to moderate in the coming years; however still to be in excess of other global markets. Key however in this context is for investors to adjust their mindset and to focus less on GDP growth and to instead look at the quality and sustainability of corporate earnings growth. Lilian believes that the market is well positioned to deliver further upside over the medium term as financial deleveraging continues and sees no hard landing risks. The team continues to look for growing companies which are trading at reasonable prices, looking to capitalise on mispricing opportunities, studying earning forecasts, which they believe can provide indicators of potential opportunities when they differ from the market consensus. This is then combined with a fundamental bottom up stock selection process and results in a concentrated portfolio of between 30-40 stocks, taking active single stock and sector bets. Against the backdrop of the above macro view, the Fund’s portfolio is currently being focussed towards themes / sectors that have high levels of growth momentum, resulting in active overweight exposure to; Consumer Discretionary (+28.73% relative) and materials, whilst being notably underweight Financials (-13.34%) and IT. Whilst IT is underweight on a relative basis, this remains the Fund’s second largest exposure at the sector level, representing 33.42% of the portfolio as at the end of December 2017, with 4 of the top 5 holdings being within the sector, with Tencent remaining the Fund’s largest position. “Tencent remains a large position in the Fund. We are unfortunately underweight because Tencent represents about 18% of the MSCI China index and we are constrained by UCITS-compliance rules in the Fund (maximum holding of 10% for any stock). Alibaba is another big play for the fund. We are also heavily weighted in other Chinese technology companies. Peer Group (5-95%): Open End Funds – Europe / Africa / Asia – Greater China Equity. Currency: US Dollar. Source Data: Total Return. Performance data as at end of February 2018. Lilian Co explains why China’s ‘New Economy’, a term she uses to describe the region’s growing technology, healthcare and education sectors, is likely to lead the market to sustained economic growth over the longer term. 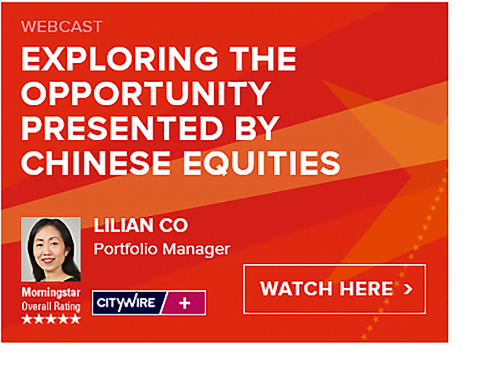 In this webcast: Exploring the Opportunity Presented by Chinese Equities – Lilian Co provided insight regarding her optimism for China’s economic trajectory and the opportunity for sustained growth. We now offer Swiss investors the opportunity to invest in China’s fast-growing equity markets by offering a fully hedged Swiss Franc Class of the fund. “You can’t avoid Tencent” – Read the Investment Europe article (as referred to above).